The result was a prophetic list of the succession of the Papacy with mottos representing the name or heraldry of the next 112 Popes, that was handed to Pope Celestine II. The prophetic manuscript was then deposited in the Vatican Secret Archives, and forgotten about until its rediscovery in 1590. Source: O’Brien 1880, p. 83; Bander 1969, p. 96. 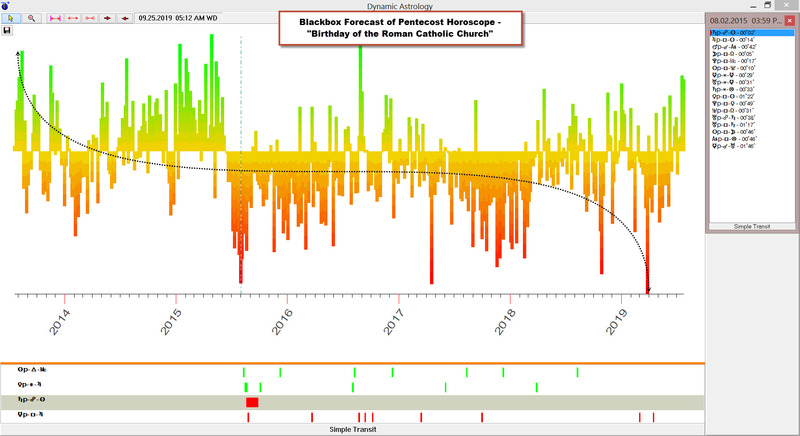 In order to determine if there is any relevant mundane astrological correlation of Saint Malachy’s Papal prophecy we will need to determine the horoscope of the Catholic Church by reviewing the biblical narrative of Pentecost -described by Christians today as the “Birthday of the Church,” where the 11 Disciples of Christ (Acts 1:13, 26), along with about 109 other individuals (Acts 1:15), including many women, among whom was Mary the mother of Jesus (Acts 1:14), received the Baptism in the Holy Spirit in the Upper Room, of Cenacle in Jerusalem. Pentecost is the old Greek name for the Jewish harvest festival in the calendar of ancient Israel celebrating the giving of the Law on Sinai. This feast is still celebrated today as Shavuot. Now based on the apostle John’s (John 19:31) account, Jesus was taken by the high priests and soldiers, judged, beaten, humiliated, and crucified, before the Passover feast’s “high day” (on the Sabbath when the Passover lambs were being slaughtered), on Nissan 14 on April 1st, 33 AD at approximately 3:00 pm LMT in Jerusalem. This date is confirmed by astronomical calculations that show that the date of the crucifixion, derived from calculating the dates when the crescent (waxing) of the New Moon would be first visible from Jerusalem, which marked by Jews as the first day of a lunar month to be April 2, 33 AD. This is also confirmed from the time Jesus began his three year public ministry shortly after he reached the age of 31, in mid October of 29 AD -“Repent, for the Kingdom of Heaven is Near”, during in the 15th year of the Emperor Tiberius’s reign, which satisfies the statement in Luke 3:23 “And when He began his ministry, Jesus Himself was about thirty years of age…”, and also by 2nd Century Christian scholars, such as Irenaaus who said that Jesus “of was beginning to be about thirty years of age” [Against Heresies h, II, xxii, 5]. In 33 AD, the Feast of Weeks of Shevuot which commemorates God giving the Ten Commandments at Mount Sinai fifty days after Passover (April 2-3,), occurred on sunrise on Sunday May 22nd. On that day, the Holy Spirit was then sent (Acts 2.1-4) at Pentecost (Sivan 6). According to the New Testament book of Acts (Acts 2:15), 2 When the day of Shevuot came (Hellenistic Jews later gave it the name Pentecost), they (the Apostles) were all together in one place. 2 Suddenly a noise came from heaven. It sounded like a strong wind blowing. This noise filled the whole house where they were sitting. 3 They saw something that looked like flames of fire. The flames were separated and stood over each person there. 4 They were all filled with the Holy Spirit, and they began to speak different languages. The Holy Spirit was giving them the power to do this. 5 There were some godly Jews in Jerusalem at this time. They were from every country in the world. 6 A large crowd came together because they heard the noise. They were surprised because, as the apostles were speaking, everyone heard in their own language. 7 They were all amazed at this. They did not understand how the apostles could do this. They said, “Look! These men we hear speaking are all from Galilee. 8 But we hear them in our own languages. How is this possible? We are from all these different places: 9 Parthia, Media, Elam, Mesopotamia, Judea, Cappadocia, Pontus, Asia, 10 Phrygia, Pamphylia, Egypt, the areas of Libya near the city of Cyrene, Rome, 11 Crete, and Arabia. Some of us were born Jews, and others have changed their religion to worship God like Jews. We are from these different countries, but we can hear these men in our own languages! We can all understand the great things they are saying about God.” 12 The people were all amazed and confused. They asked each other, “What is happening?” 13 But others were laughing at the apostles, saying they were drunk from too much wine. 14 Then Peter (who would eventually become the 1st Pope of the future Roman Catholic Church) stood up with the other eleven apostles. He spoke loudly so that all the people could hear. He said, “My Jewish brothers and all of you who live in Jerusalem, listen to me. I will tell you something you need to know. Listen carefully. 15 These men are not drunk as you think; it’s only nine o’clock in the morning. Peter in (Acts 2:39) says, 39 “This promise is for you. It is also for your children and for the people who are far away. It is for everyone the Lord our God calls to himself.” Stating that this event was the beginning of a continual outpouring that would be available to all believers from that point on, Jews and Gentiles alike. Acts 2:41 then reports: “Then they that gladly received his word were baptized: and the same day there were added unto them about three thousand souls.” Peter stated that this event was the beginning of a continual outpouring that would be available to all believers from that point on, Jews and Gentiles alike. 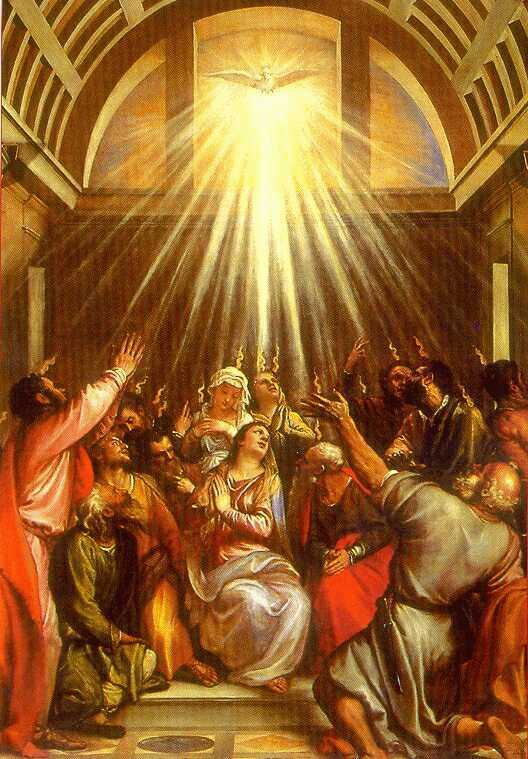 Based on the above stated testimony given in the second chapter of the Book of Acts of the descent of the Holy Spirit upon the Apostles, became know as Pentecost. 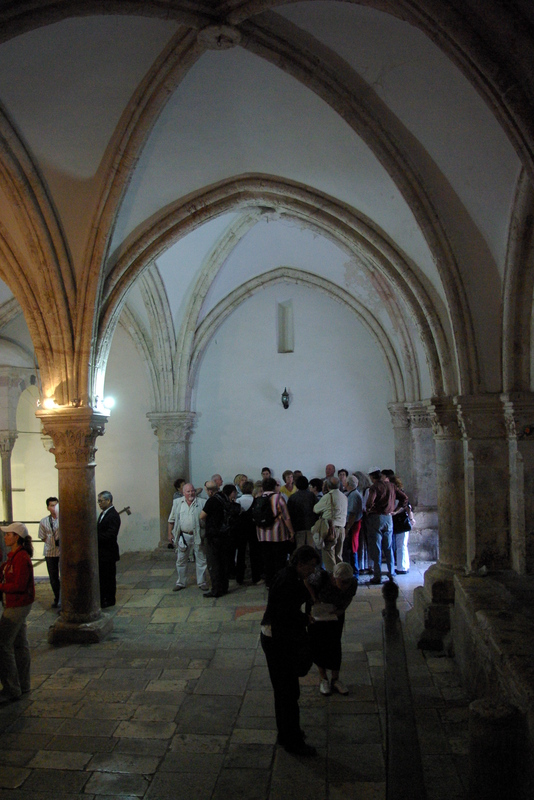 A spiritual event that took place on May 22nd 33 AD at 9:00 AM LMT in Jerusalem in Roman Judea. This event where one hundred and twenty followers of Christ, including the Twelve Apostles (the Eleven faithful disciples and Matthias who was Judas’ replacement), his mother Mary, various other women disciples and his brothers where present, signaled the beginning of the public ministry of the Church and can be considered the “birth event” of the Christian Church, that would eventually become the Roman Catholic Church by the early 2nd Century. Now if Saint Malachy’s Papal Prophecy is credible, based on the Pentecost horoscope we can project the several stages leading up to the Apocalypse. Again, according to approved Catholic Papal Prophecy, after the selection of the 266th Pope – Pope Francis – stage I, there will be a time of miracles, with mass healings and divine apparitions – stage 2, along with signs in the heavens and followed by great tribulations – stage 3. ܫܶܡܥܽܘܢ ܟ݁ܺܐܦ݂ܳܐ Bethsaida, Galilea Apostle of Jesus from whom he received the keys to the Kingdom of Heaven, according to Matthew 16:18–19 . Executed by crucifixion upside-down; feast day (Feast of Saints Peter and Paul) 29 June, (Chair of Saint Peter) 22 February. Recognized by the Catholic Church as the first Bishop of Rome (Pope) appointed by Christ. Also revered as saint in Eastern Christianity, with a feast day of 29 June. LINUS Linus Tuscia Feast day 23 September. Also revered as a saint in Eastern Christianity, with a feast day of 7 June. 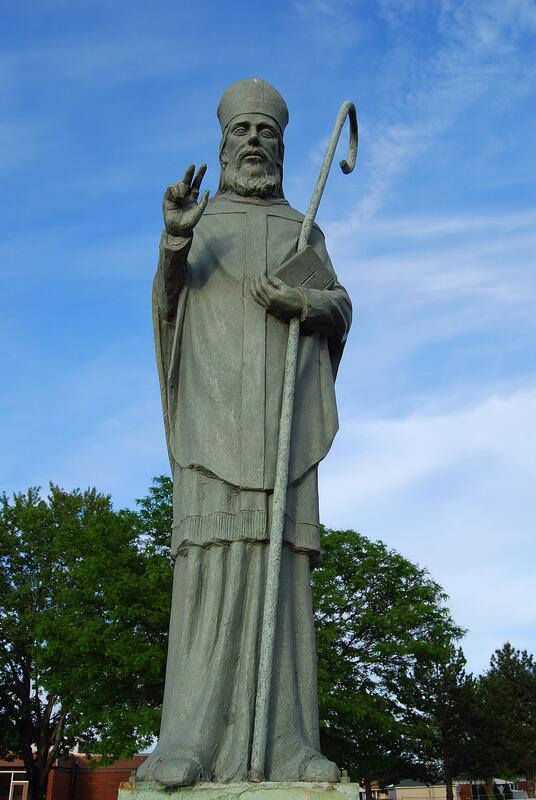 ALEXANDER Alexander Rome Also revered as a saint in Eastern Christianity, with a feast day of 16 March. XYSTUS Xystus Rome 6 April. Also revered as a saint in Eastern Christianity, with a feast day of 10 August. URBANUS Urban Rome Also revered as a saint in Eastern Christianity, with a feast day of 25 May. PONTIANUS Pontianus Rome First to abdicate office after exile to Sardinia by Emperor Maximinus Thrax. TheLiberian Catalogue records his death on 28 September 235, the earliest exact date in papal history. ANTERUS Anterus Petilia Policastro – Calabria Also revered as a saint in Eastern Christianity, with a feast day of 5 August. FABIANUS Fabianus Rome Feast day 20 January. Also revered as a saint in Eastern Christianity, with a feast day of 5 August. STEPHANUS Stephanus Rome Martyred by beheading; feast day 2 August. Also revered as a saint in Eastern Christianity, with the same feast day. XYSTUS Secundus Sixtus Greece Martyred by beheading. Also revered as a saint in Eastern Christianity, with a feast day of 10 August. CAIUS Gaius Martyred (according to legend) Feast day 22 April. Also revered as a saint in Eastern Christianity, with a feast day of 11 August. MARCELLINUS Marcellinus Feast day 26 April. Also revered as a saint in Eastern Christianity, with a feast day of 7 June. SILVESTER Sant’Angelo a Scala, Avellino Feast day 31 December. Also revered as a saint in Eastern Christianity, with a feast day of 2 January. First Council of Nicaea, 325. Papa LEO MAGNUS Rome Convinced Attila the Hun to turn back his invasion of Italy. Wrote the Tome which was instrumental in the Council of Chalcedon and in defining the hypostatic union. Feast day 10 November. Also revered as a saint in Eastern Christianity, with a feast day of 18 February. Papa GELASIUS Gelasius Africa To date, the last pope to have been born on the continent of Africa. Papa IOHANNES Secundus Mercurio Rome First pope to not use personal name. This was due to Mercury being a Roman god. Papa AGAPITUS Agapito Rome, Ostrogothic Kingdom Feast days 22 April 20 September. Also revered as a saint in Eastern Christianity, with a feast day of 17 April. O.S.B. Rome First to formally employ the titles “Servus servorum Dei“ and “Pontifex Maximus“. Feast day 3 September. Also revered as a saint in Eastern Christianity, with a feast day of 12 March. O.S.B. Marsi First Pope to bear the same name as his immediate predecessor. Member of the Order of Saint Benedict. Papa MARTINUS Martino Near Todi, Umbria, Byzantine Empire Feast Day 12 November. Also revered as a saint in Eastern Christianity, with a feast day of 14 April. O.S.B. Rome, Byzantine Empire Sometimes called Pope Adeodatus (without a number) in reference to Pope Adeodatus I sometimes being called Pope Deusdedit. Member of the Order of Saint Benedict. Papa GREGORIUS Tertius Syria Third pope to bear the same name as his immediate predecessor. Was previously the last pope to have been born outside Europe until the election of Francis in 2013. O.S.B. Rome 8 Member of the Order of Saint Benedict. O.S.B. Tivoli Member of the Order of Saint Benedict. O.S.B. 3 Member of the Order of Saint Benedict. Papa BENEDICTUS Quintus Rome <1 Elected after John XII‘s death by the people of Rome, in opposition to the Antipope Leo VIII who was appointed by Emperor Otto; Benedict accepted his deposition in 964 leaving Leo as sole pope. Papa CLEMENS Secundus Suidger Hornburg, Duchy of Saxony, Holy Roman Empire Appointed by Henry III at the Council of Sutri; crowned Henry III as Holy Roman Emperor. Papa LEO Nonus Bruno, Count of Dagsbourg Eguisheim, Swabia, Holy Roman Empire In 1054, mutual excommunications of Leo IX and Patriarch of Constantinople Michael I Cerularius began the East–West Schism. The anathematizations were rescinded byPope Paul VI and Patriarch Athenagoras in 1965. Papa STEPHANUS Nonus (Decimus) Frédéric de Lorraine, O.S.B. Duchy of Lorraine, Holy Roman Empire Sometimes called Stephen X. Member of the Order of Saint Benedict. O.S.B. Sovana, Italy, Holy Roman Empire Initiated the Gregorian Reforms. Restricted the use of title “Papa” to the Bishop of Rome. Member of the Order of Saint Benedict. Political struggle with German Emperor Henry IV, who had to go to Canossa (1077). O.S.B. Benevento, Duchy of Benevento Member of the Order of Saint Benedict. Papa URBANUS Secundus Odo of Lagery, O.S.B. Lagery, County of Champagne, France Started the First Crusade. Member of the Order of Saint Benedict. O.S.B. Bleda, Papal States, Holy Roman Empire Member of the Order of Saint Benedict. Papa GELASIUS Secundus Giovanni Coniulo, O.S.B. Gaeta, Principality of Capua Member of the Order of Saint Benedict. Papa EUGENIUS Tertius Bernardo da Pisa, O.Cist. Pisa, Republic of Pisa, Holy Roman Empire Member of the Order of Cistercians. Announced the Second Crusade. Papa HADRIANUS Quartus Nicholas Breakspear, Can.Reg. Abbots Langley, Hertfordshire, Kingdom of England First and only English pope; purportedly granted Ireland to Henry II, King of England. Canon Regular of St. Rufus Monastery . Papa COELESTINUS Quintus Pietro da Morrone, O.S.B. Sant’Angelo Limosano, Kingdom of Sicily One of the few popes who resigned. Member of the Order of Saint Benedict. Papa BENEDICTUS Undecimus Niccolò Boccasini, O.P. Treviso Member of the Dominican Order. Papa BENEDICTUS Duodecimus Jacques Fournier, O.Cist. Saverdun, County of Foix, France Pope at Avignon. Member of the Order of Cistercians. Papa URBANUS Quintus Guillaume (de) Grimoard, O.S.B. Grizac, Languedoc, France Pope at Avignon. Member of the Order of Saint Benedict. Papa GREGORIUS Duodecimus Angelo Correr Venice, Republic of Venice [R] Western Schism; abdicated during the Council of Constance, which had been called by his opponent John XXIII. Papa EUGENIUS Quartus Gabriele Condulmer, O.S.A. Venice, Republic of Venice 47 / 63 [B] Member of the Augustinian Order. Crowned Sigismund emperor at Rome in 1433. Transferred the Council of Basel to Ferrara. It was later transferred again, to Florence, because of the Bubonic plague. Papa NICOLAUS Quintus Tommaso Parentucelli Sarzana, Republic of Genoa 49 / 57 Held Jubilee of 1450. Crowned Frederick III emperor at Rome in 1452. Created a library in the Vatican which would eventually become the Bibliotheca Apostolica Vaticana. Papa PIUS Secundus Enea Silvio Piccolomini Corsignano, Republic of Siena 52 / 58 Interest in urban planning. Founded Pienza (near Siena) as the ideal city (1462). Papa XYSTUS Quartus Francesco della Rovere, O.F.M. Celle Ligure, Republic of Genoa 57 / 70 Member of the Franciscan Order. Commissioned the Sistine Chapel. Authorized an Inquisition targeting converted (Jewish) Christians in Spain, at the request of Queen Isabella and King Ferdinand. Papa ALEXANDER Sextus Rodrigo de Lanzol-Borgia Xàtiva, Kingdom of Valencia, Crown of Aragon 61 / 72 Nephew of Callixtus III. Father to Cesare Borgia and Lucrezia Borgia. Divided the extra-European world between Spain and Portugal in 1493 by the Bull Inter caetera. Papa LEO Decimus Giovanni di Lorenzo de’ Medici Florence, Republic of Florence 37 / 45 Son of Lorenzo the Magnificent. Excommunicated Martin Luther. Extended the Spanish Inquisition into Portugal. Papa CLEMENS Septimus Giulio di Giuliano de’ Medici Florence, Republic of Florence 45 / 56 Cousin of Leo X. Rome plundered by imperial troops (“Sacco di Roma“), 1527. He forbade the divorce of Henry VIII and crowned Charles V Emperor at Bologna in 1530. His niece Catherine de’ Medici was married to the future Henry II of France. Papa IULIUS Tertius Giovanni Maria Ciocchi del Monte Rome, Papal States 62 / 67 Established the Collegium Germanicum. Papa XYSTUS Quintus Felice Peretti, O.F.M. Conv. Grottammare, Marche, Papal States 63 / 68 Member of the Conventual Franciscan Order. Papa LEO Undecimus Alessandro Ottaviano de’ Medici Florence, Duchy of Florence 69 / 69 Nephew of Leo X.
Papa PAULUS Quintus Camillo Borghese Rome, Papal States 52 / 68 Known for building projects, including the facade of St Peter’s Basilica. Papa ALEXANDER Septimus Fabio Chigi Siena, Grand Duchy of Tuscany 56 / 68 Great-nephew of Paul V. Commissioned St. Peter’s Square. Papa CLEMENS Nonus Giulio Rospigliosi Pistoia, Grand Duchy of Tuscany 67 / 69 Commissioned the colonnade of St. Peter’s Square. Papa CLEMENS Decimus Emilio Altieri Rome, Papal States 79 / 86 Canonized the first saint from the Americas, Saint Rose of Lima, in 1671. Papa INNOCENTIUS Undecimus Benedetto Odescalchi Como, Duchy of Milan 65 / 78 Suspected to have secretly funded William III of Orange‘s Glorious Revolution to overthrow the Catholic James II of England. Papa BENEDICTUS Tertius Decimus Pierfrancesco Orsini, O.P. Gravina in Puglia, Kingdom of Naples 75 / 81 Member of the Dominican Order. Third and last member of the Orsini family to be Pope. Papa CLEMENS Quartus Decimus Giovanni Vincenzo Antonio Ganganelli,O.F.M. Conv. Sant’Arcangelo di Romagna, Papal States 63 / 68 Member of the Conventual Franciscan Order. Suppressed the Jesuit Order. Papa PIUS Sextus Count Giovanni Angelo Braschi Cesena, Papal States 57 / 81 Condemned the French Revolution and was expelled from the Papal States by French troops from 1798 until his death. –14 March 1800 Interregnum six month period without a valid pope elected. This was due to unique logistical problems (the old pope died a prisoner and the Conclave was in Venice) and a deadlock among cardinals voting. Papa PIUS Septimus Count Barnaba Niccolò Maria Luigi Chiaramonti, O.S.B. Cesena, Papal States 57 / 81 Member of the Order of Saint Benedict. Present at Napoleon’scoronation as Emperor of the French. Temporarily expelled from the Papal States by the French between 1809 and 1814. Papa LEO Tertius Decimus Gioacchino Vincenzo Raffaele Luigi Pecci,O.F.S. Carpineto Romano,Lazio, Papal States. 67 / 93 Issued the encyclical on social teaching, Rerum Novarum (On Capital and Labor) and supported Christian democracy as against communism; the fourth-longest reigning pope after Pius IX, St Peterand John Paul II. Papa PIUS Decimus Giuseppe Melchiorre Sarto Riese, Lombardy-Venetia, Austrian Empire 68 / 79 Encouraged and expanded reception of Holy Communion, and combatted Modernistic theology. Most recent pope to be canonized. Papa BENEDICTUS Quintus Decimus Giacomo Paolo Giovanni Battista della Chiesa Genoa, Kingdom of Sardinia 59 / 67 Credited for intervening for peace during World War I. Remembered by Pope Benedict XVI as “prophet of peace”. Papa PIUS Undecimus Achille Ambrogio Damiano Ratti Desio, Lombardy-Venetia, Austrian Empire 64 / 81 Signed the Lateran Treaty with Italy, establishing the Vatican City as a sovereign state. Created the Pontifical Academy of Sciences. (“The work of justice [shall be] peace”) Eugenio Maria Giuseppe Giovanni Pacelli Rome, Italy 63 / 82 Invoked papal infallibility in encyclical Munificentissimus Deus. (“Obedience and peace”) Angelo Giuseppe Roncalli Sotto il Monte, Bergamo, Italy 76 / 81 Opened Second Vatican Council; sometimes called “Good Pope John”. (“With Him on the mount”) Giovanni Battista Enrico Antonio Maria Montini Concesio, Brescia, Italy 65 / 80 The last pope to be crowned with the Papal Tiara. First pope to travel to the United States. Concluded Second Vatican Council. (“Humility”) Albino Luciani Forno di Canale, Veneto, Italy 65 / 65 First pope to use ‘the First’ in regnal name. First pope with two names, for his two immediate predecessors. (“Totally yours”) Karol Józef Wojtyła Wadowice, Poland 58 / 84 First Polish pope, first non-Italian pope in 455 years and first pope to travel to Canada. Canonized more saints than all predecessors. Traveled extensively. Third longest known reign after Pius IX and St Peter. Beatified by Pope Benedict XVI. (“Cooperators of the truth”) Joseph Alois Ratzinger Marktl am Inn, Bavaria, Germany 78 / 85 Oldest to become pope since Pope Clement XII in 1730. Elevated theTridentine Mass to a more prominent position. First pope to renounce the Papacy on his own initiative since Pope Celestine V in 1294,retaining regnal name with title of pope emeritus. (“by having mercy, by choosing him”) Jorge Mario Bergoglio, S.J. 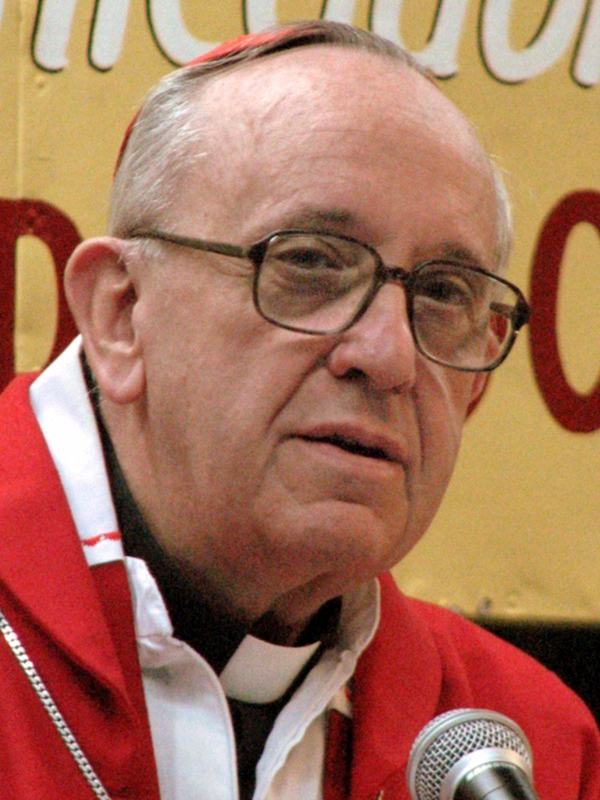 Buenos Aires, Argentina 76 / – First pope born outside Europe since St. Gregory III and first from the Americas. First Pope from the Southern Hemisphere. First Jesuitpope. First to use a new and non-composed regnal name sinceLando (913–914). A bit of history on the Roman church – it was in 325 AD JC at the council of Nicea – now Iznik Turkey – attended by the Emperor Constantine – the first Christian Emperor of Rome – his legacy, because of his conversion to Christianity – was to make christianity the official religion of the empire – and thus the papacy itself was established – the council took place starting June 19 325 AD Julian Calendar, run the chart for sunrise, Constantine arrived 14th June, the council commenced its formal meetings on the 19th and concluded them on the 25 August 325 AD JC. One of the major concerns was the expunging of the Heterodox Heresy of Origen, that the Father was not the original creator. There were 318 Bishops in attendance. This chart has been tested against events in the Roman Church and found to be radical, and still highly active. Prior to this event the Roman Church did not effectively exist. There is no extant proof that ‘Jesus’ actually existed – but there is evidence of John the Baptist. Additionally the events of the story of Jesus as passed down to us do not match the actual known history of the period – alignment of Herod with various events (including the census) etc etc are not in accord with extant records. Additionally the new testament is a compilation of apocryphal texts by various authors, most, if not all, of which were written down at least 2 and likely three hundred years after the events they purportedly depict. It is likely that the other work of the Council was the assembly of the official history of the religion and its teachings to make sure that the Heresy of Origen – and other matters, were excluded from doctrine – and what better way to do this than to write your own history – as is done by all governments and corporations world wide now. Martin, I agree with you that a chart for the Pentecost (if it ever really happened) would not be a chart for the Catholic Church per se. For those who advocate a 325 AD chart, do they propose a time, also? The Roman Catholic Church has always taken liberties with the truth, concerning herself, the New Testament, Church history, so-called saints, Mary the mother of Yeshua, the Apostles, and even about Yeshua. But the fact of the matter, Martin, is that the Catholic Church existed long before the Council of Nicene in 325AD. She was born in the turmoil following the fall of Jerusalem. First, the Jews shoved the Jewish followers of the Way out of Judiasm. Soon afterward, Roman and Greek converts overwhelmed the Jewish followers of the Way and turned such into the travesty that has become known as Christianity. At that point, the Catholic Church was born. Even so, I will agree with you about the writings in the New Testament to degree that the Roman Catholic Church has twisted the truth about their origins. It is close to a sure bet that none of the Apostles wrote any of them. John most definitely did not write the religious novel the Gospel of John. Likewise, he did write the Book of Revelation, which is of exceedingly dubious inspiration, considering the fact that it begins and ends with false prophecies by claiming that its supposed prophecies would unfold soon (as in the near future–ie, within a generation or two). Nevertheless, all that the Council of Nicene did, besides alienate many Christians, while codifying the Catholic Church’s pagan-inspired blasphemy (the nonsense that Jesus is God) through the Nicene Creed, was make official what had been going on for two and a half centuries…. Yes–very bad times are coming. The end of civilization as we known it will occur during the next couple of decades. So-called Christianity is doomed. God and the Son will replace it with the Truth. Perhaps, some of what the book of Revelation predicts will occur. A figure that could be termed the Anticchrist is already here. He is in one or another part of what was once Yugoslavia. He will work closely with the Roman Catholic Church–or vice versa–which will lead to the church’s death. Likewise, he will destroy Israel and most Islamic nations. But he and a figure that could be termed the False Prophet will not succeed in ruling the entire Earth. China and the nations of Central Asia will oppose them. So, too, will Russia or whatever is left of her after the war that destroys America and wrecks Western Europe. I seriously doubt that India and indonesia will play along with them, either…. 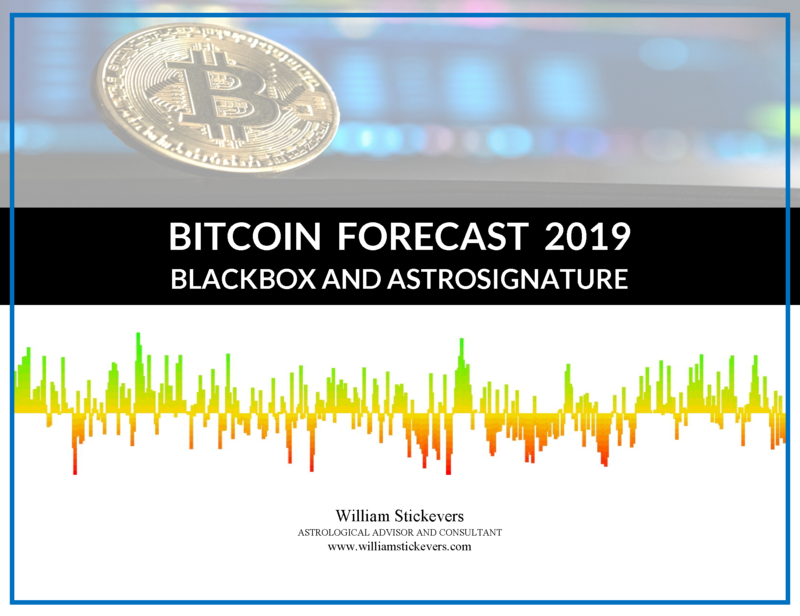 William Stickevers, I cannot say if your charts are correct. They sound as if they probably are…This topic is exceedingly interesting. Perhaps, you should try to cast a chart for Yeshua. Keep in mind that he was older than Luke claims when he began his ministry. The good bet is that he was born in either 6BC or 7BC since he was probably born at least two years before Herod the Great perished. I have long thought he was probably born around May 23, 7BC due to the Jupiter/Saturn-Moon conjunction in Pisces…. Now – Does anyone have even a putative timing on Moses bringing the ten commandments to the Jews? I agree that a great deal of turmoil attended so-called Christianity before the Council of Nicene. But the fact of the matter is that the Catholic Church began way back, during the times that I mentioned. 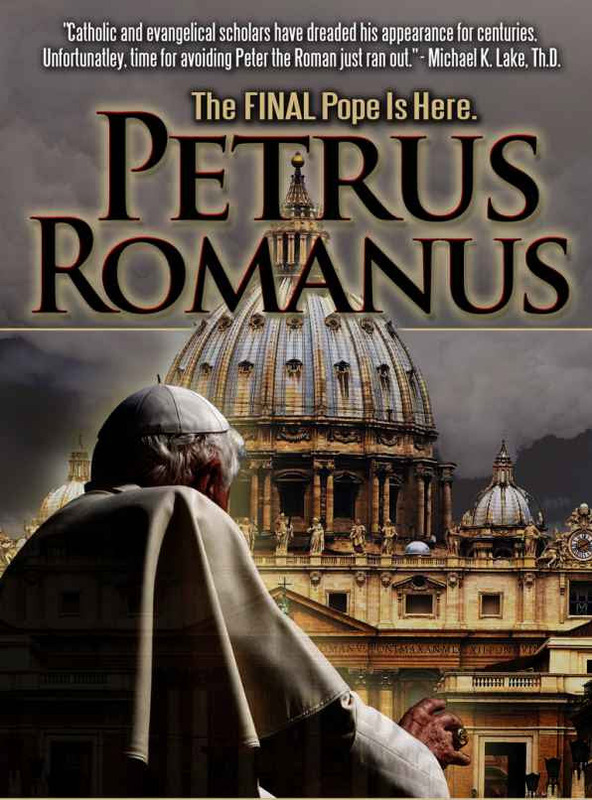 Though it might not have always officially been the “Roman Catholic” Church, the bishop of Rome and his cronies held more sway over the Catholic Church than did anyone else from the waning decades of the First Century onward. The organization that became the official Roman Catholic Church was the very same organization that began in the aftermath of the fall of Jerusalem–the point in which the Way began devolving into Christianity. At that point, the capitial of the movement shifted from Jerusalem to Rome…Keep in mind that so-called Christianity included various movements, sects, and cults before the Council of Nicene. The most prominent of them was the Catholic Church–the so-called orthodox faith…Actually, the hierarchal structure that you are referring to dates back to Ignatius. His influence helped such become a formal reality within the Catholic Church and most of the remainder of Christianity…From my perspective, the Council of Nicene is the point in which the Catholic Church formalized her apostasy and began committing spiritual adultery with the Roman Emperor. So, yes, it was a huge turning point…. Oh, by the way, the day of Pentecost was the birth of the Way, which was hijacked by Roman and Greek converts that transformed such into so-called Christianity, which they polluted with their pagan notions…. One other by the way, was not the zodiac nearly a full sign ahead of where it is now in the year 33AD due to the great cycle that causes the zodiac to drift counterclockwise one degree every seventy-two years? If so, the sun would have been in late Gemini or early Cancer instead of Taurus on May 22, 33BC. that would be if we mistake the two zodiacs for each other – the zodiac we use is the tropical zodiac – the one you are referring to is the so called sidereal zodiac – Tropicality defines 0 Aries as being when the Sun crosses Zero declination moving North – that is when the Sun is exactly over head at the equator. – Our tropical cycle is the cycle of the Sun’s declination – its seasonal in the Northern hemisphere. 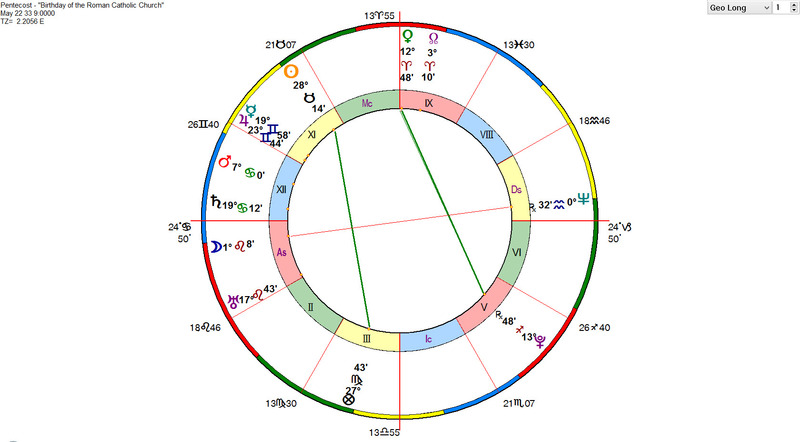 This, by the way, defines Astrology as a Northern Hemisphere art. Around 0 CE we are looking at an almost perfect alignment of Tropical and sidereal zodiacs… So 0 Aries sidereal was very close to zero Aries Tropical – 2000 years ago there was less separation between the zodiacs.. The rate of precesson is 72 years = 1 degree of shift in the alignment. There is not full agreement of constellational alignment with either zodiac since the separation of the constellations and their actual span are not 30 degree segments with clear start and stop boundaries – the zodiacs we use are conventions – Sidereal is defined by a Fiducial – in the case of the Lahiri Ayanamsa the star Spica is used as the fixed point. The idea of a fixed point relates only to the actual stars…. There is a lot of work written on this – if you are really interested in the matter then I recommend a two volume book – Secrets of the Ancient Skies by Diana K Rosenberg – she was the worlds authority on the stars, their alignments and meanings – the book was published just before her death. You can find it by Google search and it is fascinating reading – and a great tool for consulting astrologers. 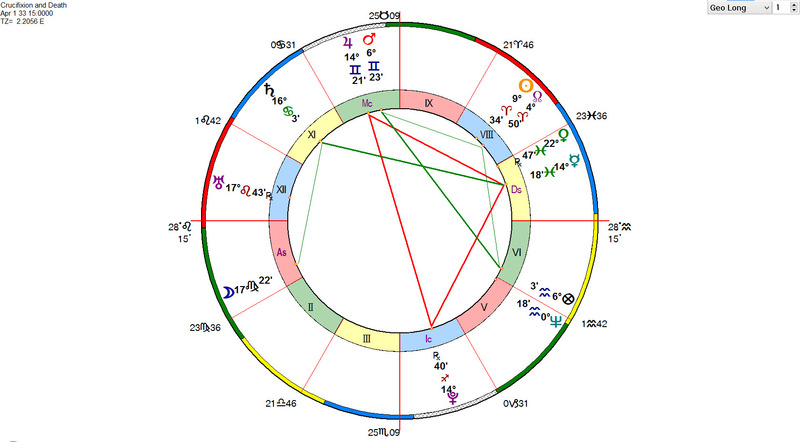 I won’t speculate as to whether the chart is radical or not – but as a Uranian astrologer – I can tell you it has most of the necessary interactions. Thanks for the tip concerning the book…The day that you mention might well be the right one. The problem is that the so-called Star of Bethleham–the conjunction of Jupiter and Saturn–was still nearly two months away. It was exact on May 23, 7BC. If the Magi were interested in such matters, they would have known that Jupiter and Saturn would conjoin on that date. It would have been a lovely sight. Plus, it would have been Saturday. That is far more likely of a day for Yeshua to be born on than a Sunday. Besides, a Uranus-Jupiter conjunction would have not meant anything to the Magi or anyone else since Uranus was invisible and unknown to them…As for the Tropical/Sideral matter. I know your assertions are correct. But it makes no sense to me to use a fixed tropical system since the actual zodiac migrates. 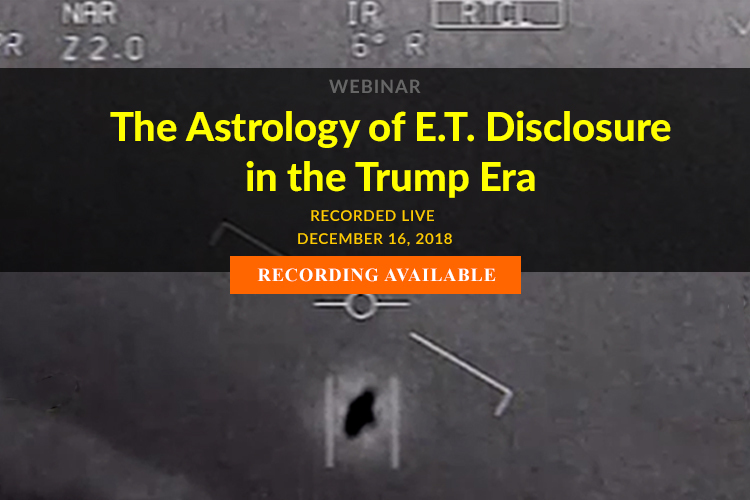 And the ancient astrologers not only charted the conjunctions of the chronocrators Saturn and Jupiter – they knew where to expect them in their conjunctions – I believe that what is referred to in the story of the Magi is a transposition in time to make the birth auspicious…. I agree that the story of the Magi is fictious. None of it makes any sense. Herod’s spies would have trailed them to Bethleham–and that would have been the end of the story…As far as a nova being the culprit, Chinese astronomers noted no nova, during the period that Yeshua was born. They kept meticulous records of such phenomina. But, of course, they might have missed one. There might also be a hole in their records. I, however, still think a conjunction between Jupiter and Saturn in Pisces would be a worthy component of Yeshua’s chart. But I am no astrologer–just a seeker of knowledge and truth…It is funny that you mention fixed stars. Recently, I became curious about them and their relationship to astrology. And so, I cast a chart revealing the angles between many of the most conspicuopus of them and the planets in my birth chart…I do not know how astrology works. But I do realize there is definitely something to it. I wish I had known more about it way back in my youth. I would have made fewer mistakes and avoided certain individuals that I allowed myself to wander to close to. Oh well. Live and learn…. Since Elizabeth (John’s mother) was in her sixth month of pregnancy when Jesus was conceived (Luke:1:24-36), we can determine the approximate time of year Jesus was born if we know when John was born. John’s father, Zacharias, was a priest serving in the Jerusalem temple during the course of Abijah (Luke:1:5). Historical calculations indicate this course of service corresponded to June 13-19 in that year (The Companion Bible,1974, Appendix 179, p. 200). It was during this time of temple service that Zacharias learned that he and his wife Elizabeth would have a child (Luke:1:8-13). 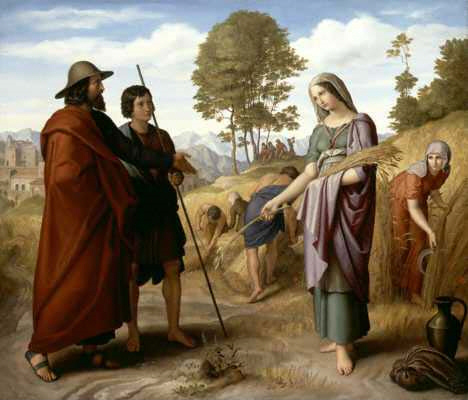 After he completed his service and traveled home, Elizabeth conceived (Luke:1:23-24). Assuming John’s conception took place near the end of June, adding nine months brings us to the mid-late March as the most likely time for John’s birth. Adding another six months (the difference in ages between John and Jesus) brings us to mid- to late-September as the likely time of Jesus’ birth. Their is facts and fiction or myth one must be able to distinguish the two ! Mystery prophecy are not the same concept. False Prophets are many true Prophets are few. As most agree charlatans abound hoping to make their living selling predictions and prophecy often false and lies ! The First Christmas Celebration – 336 A.D.